The dimachearus gladiator was well equipped for offensive and close quarter combat, with their name translating as ‘bearing two knives’ which aptly describes the dimacheari armaments. The Dimachearus were armed with two scimitar blades known as siccae, curved and perfectly designed for slicing attacks on an opponent. These gladiators are shrouded in mystery with very little information from Roman times about them, but their legacy has still survived to this day as that rarity of a gladiator with no shield. Thought to be highly skilled fighters the dimachearus were able to use their sica blades to navigate the armour of their foes, using the curves to sneak around shield’s and armour, and make effective strikes to their opponents limbs, sides and back. As we already mentioned in the intro the weapons for this gladiator were a rare combination of two curved scimitar blades called Sica. These weapons were typically from 30cm to 45 cm in length putting them in the class of short sword, or in a smaller variant even classed as a dagger. The curve of this blade is probably its most important design feature, as it allowed the wielder to attack around shields in a rather effective manner. 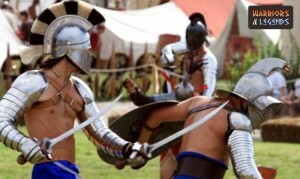 With many gladiators being armed with large shields like a scutum, the siccae would let a skilled fighter make successful attacks even on a well defended foe. A dimachaerus gladiator using his speed and agility to attack the back of his foe with his sica. This blade itself was quite contentious in Rome, the traditional Roman sword the Gladius is very much the opposite of this type of blade, and the Romans had strong opinions about Sica blades. It was often thought this type of weapon was sneaky and users were considered to be assassin in nature, and typically stealthy types of fighters, rather than the very matter of fact style of the Roman arms. Out of all the gladiator classes, it’s though the dimachearus had maybe the most variance of them all. It has been reported that this gladiator was often lightly armoured and we believe this is certainly true. The dimachearus are thought to sometimes fight with literally no armour, with only a loin cloth and sword holder over their shoulder which was known as a balteus. Other reports and pictures depict the dimachearus as wearing chain mail vests and visored helmets, greaves and legs wrappings which could all surely be true. I think the main thing to consider with this class is that they would likely be less armoured than any foe they faced. With their stealthy curved sica blades, the dimachaerus would have fought to avoid damage with their light armour. However due to this they would have been more mobile, a necessity to successfully employ their blades upon their foe in the amphitheatre. The dimachaerus would have patiently stood, poised and ready like a snake, ready to capitalise on any of their enemies mistakes. When the time was right a strike or slash with one arm, could easily be followed by another, and these blows would have added to the toll on their foe. Thought to be something of an expert gladiator, the mysterious dimachaerus was something of a curiosity. The blades these gladiators wielded were typically non roman style, and often associated with more sneaky styles of fighting. However in the amphitheatre this gladiator likely put on a display of skill and finesse in combat. With their lightly armoured frame and agile blades, these gladiators would have likely had the crowds eyes glued on the action.